I have officially been in France for 4 days short of a month, which is a pretty crazy fact. It feels like it’s been about six months. There’s may a thing I could cover about my life here, but I’ll just stick to the basics for now. For the month of October, I have been living in the university dorms. I was told by the powers that be here in Pau that housing can be difficult to find, and that I should just live in the dorms. Not exactly the case. As soon as I got here I basically knew I wanted to live somewhere else, both for the sake of my French (there’s many assistants and English-speakers living in the dorms), and I also desperately want a kitchen, as I love cooking and baking. Needless to say, the kitchen facilities in the dorms are far from adequate. I was initially looking for a homestay-like situation, but the two families that I looked into living with didn’t work out for various reasons. 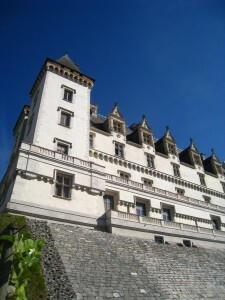 I ended up choosing a house pretty close to where I live now, and I’ll be living with three other French students. Two of them are girls close in age to me, and they were overjoyed at the prospect of having somebody to help them with their English homework. Unfortunately, they’ll be gone for November and December, my first two months in the house, because they’ll be doing internships elsewhere. So at the beginning it’ll just be me and an 18 year-old boy who didn’t seem too chatty, and possibly one of the girl’s boyfriends. But I chose the house for the fact that I’ll have a whole house at my disposal, including a dining room, living room, and large yard, and I’m sure I’ll be basking in all the extra space, plus the functioning kitchen, will keep me more than pleased for the first couple of months. The landlady was also super sweet (I found myself wishing I could live with her, although apparently she already hosts American exchange students through the university here). Yay! 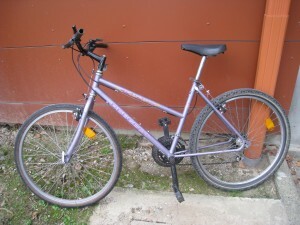 I am also now the proud owner of a purple Peugeot bike, that I use to get to the three different schools that I work at, as none of them are actually in Pau. I’m very glad I didn’t bring a helmet and lock from home for naught. Some assistants who were in Pau last year told me about a guy who has a used bike workshop. So my first Tuesday in Pau I went to check it out, and was a bit gruffly told by the guy, who had a very strong Southwestern accent, to come back on the weekend, as he didn’t have any bikes at the moment (not that I didn’t believe him, but I did find it a bit ironic that his shop was literally overflowing with bikes when I visited on Tuesday). So I went back on Saturday, and the man was in a much better mood, and asked me various questions about what I was looking for and whatnot, then showed me a rather dirty frame missing a front wheel and a seat, which he said he’d fix up for me for the grand sum of 40 euros. I told him as long as it had gears and working brakes, I would be happy. And work she does! On to the subject of teaching! All of us primary assistants were told that we’d be starting the first Thursday that I was in France. So another assistant and I showed up at our school at 8:30 am last Thursday, only to be told that the teachers didn’t know we were coming. We were told to come back next week. The very nice woman who is in charge of us primary assistants in Pau says that she had sent all our schools multiple emails about us starting on Thursday, but apparently that school didn’t get the memo, as other assistants started teaching on Thursday sans probleme. It was a rather auspicious beginning to my elementary school teaching career. Since then, things have gone a bit better, although the scheduling is still rather complicated. As it’s still the first few weeks of me teaching, I have mostly just helped teachers with their lessons by pronouncing words with my charming and authentic American accent, and occasionally taking small groups to do activities. Not surprisingly, 9 year olds are much easier to manage in groups of 6. One of my favorite things that I have so far done is have my students read Brown Bear, Brown Bear, What do you See? in small groups, each kid reading one page at a time. After our upcoming break, I will be doing more cultural presentations (in French, of course), about subjects like the election and Thanksgiving. I guess I have said very little about France itself. One of the things that I have noticed here is that people here in the Southwest seem to be a bit more friendly than up North. But do rest assured that I am eating plenty of baguettes, sampling plenty of cheese, and drinking (in moderation) a plethora of wines. Life is pretty great! The next two weeks are the Toussaint holiday, and I’ll be taking off for the Czech Republic to Couchsurf and, more importantly, visit my host family from when I was on exchange in the Czech Republic in high school. 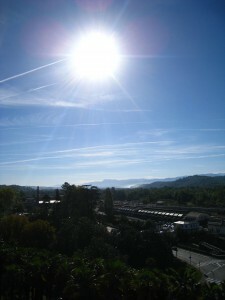 This entry was posted in Serena Berkowitz '12, France. Bookmark the permalink.